Boozeporn has returned to the The Bottle Opener once more. This time we’re taking a look at three brand new products from the soon to open Sons of Vancouver distillery in North Vancouver. The products include a vodka, a chili flavored vodka, and an amaretto. Their base product, a vodka crafted (not secretly, as it appears on the label) using a 25% malted barley mixture with wheat, and fermented using champagne yeast. It smells of vanilla bean, and a nose of aniseed. The flavors pop out over a creamy and slightly viscous texture, with hints of chocolate, and features a light peppery finish accompanying the backdrop of anise and vanilla. Letting the glass decant brings floral notes and all spice, and stronger notes of anise appear. The amaretto is a different experience. It smells and tastes strongly of a honey and molasses mixture for the total experience. It contains apricots, though, I admit that I have no idea what apricots taste like, due to my own aversion to trying fruit (I’m allergic to the peels of certain fruit, some of which are very similar to apricots), or even apricot flavored liqueurs. The closest I have come is apricot beer! But while I don’t know what apricot tastes like, I sense a quality not unlike dried dates, among stronger aromas of orange peel. 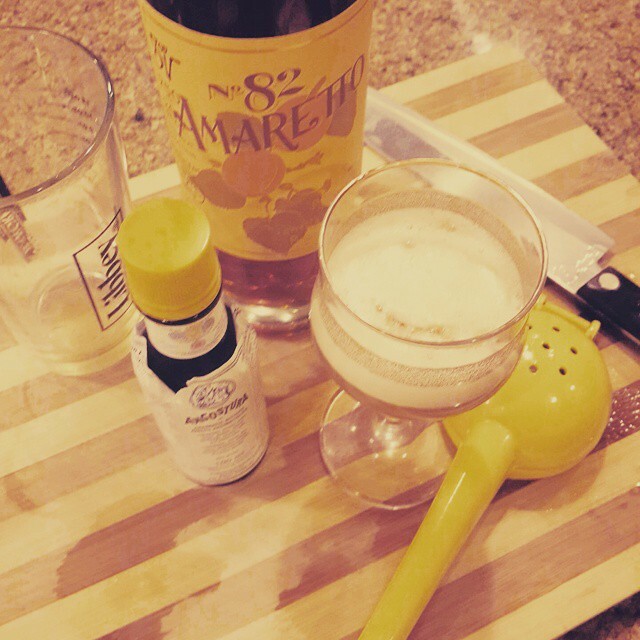 This liqueur is quite fun, even for an amaretto, which can be fun in their own right. Lastly we come to the Chili vodka which is… dangerous. Not to be taken likely, it may remind some of Tabasco. My personal recommendation would be to use it for a spicy kick, supplementing well known cocktails such as the Caesar and Bloody Mary, but also delving into the territory that I crossed not so long ago with my Prize Winning Beat Punch. But the verdict? How do these stack up against each other? Being that these are all very unique products comparing them to each other, it’s hard to single them out especially. With that in mind, though, my first choice would be the amaretto. It has a flavor profile that I believe makes it fairly unique, even when compared to other amaretto products on the market. My second pick would be the vodka, as it is an enjoyable flavor profile that marks it apart from other vodkas I’ve tasted in Vancouver. It feels like a labor of love, and a desire to create something that would stand out in the growing craft spirit community of this fine city. Lastly, I would put the chili vodka in third. While it’s true that it’s could be very useful for spicy cocktails, the truth of the matter is that I don’t make a whole lot of spicy cocktails. Nevertheless, it’s still a solid product that is fairly unique to the market. And of course, to leave on a note of sincerity… Buy the amaretto as soon as you can. Try it in an Amaretto sour, and thank me later.